The manual transmission or stick shift as we call it is as old as man himself and was once the standard style in all vehicles; unfortunately, the rapid advancement in technology threatens to put it to extinction. The automatic transmission has infiltrated the manual ranks and has generally become the choice of the majority, finding a manual transmission in just about any car is like finding a spoon in a haystack, its still hard, just not as hard as finding a needle; but even with the possible extinction the manual transmission faces, I don't think it will obliterated anytime soon. 1) Low Cost Of Maintenance Or Repair. A manual car like its rival requires continuous maintenance but unlike its rival, its cost of maintenance and repairs is significantly less. If you don't understand, go back to your secondary school teacher and ask him/her about demand and supply. Cars with manual transmissions always get better fuel economy than cars with automatic. Manual cars have been known to save drivers between 5% and 15% on their fuel costs. The manual car is more lighter and normally comes with more gears than their automatic counterparts, the aftermath is that you’ll get more kilometres out of the petrol you pump in than you would with an automatic. Automatic transmissions are designed to choose the best gear for any situation but they tend to shift to higher gears and waste engine power which doesn’t allow drivers to quickly anticipate an oncoming condition. Manual transmissions give drivers greater control over the vehicle. I'm sure most of us if not all have seen Fast n Furious(The movie, 1-7) and was wowed by the way the likes of Vin Diesel, Paul Walker(R.I.P), Lusacris and Tyrese felt totally in control - sorry scratch that, they were in total control and the cars were so submissive like watching Fifty Shades Of Grey. I mean what feeling could possible beat that!!! The transmission of a car either automatic or manual, allows the vehicle to change gears, thereby transferring power from the engine to the drive axle. This it does in the most efficient way by varying the gear ratio. Lower gears are accompanied with increased power and less speed. Higher gears, on the other hand, are accompanied with less power and increased speed and it defines how cars responds for any given situation. An automatic transmission is designed to shift in a way that doesn’t exactly use all of an engine’s power while manual transmissions tend to take advantage of more of an engine’s power thanks to more specific and exact transmission shifts. If you own a manual car, car theft shouldn't be on your list of worries. 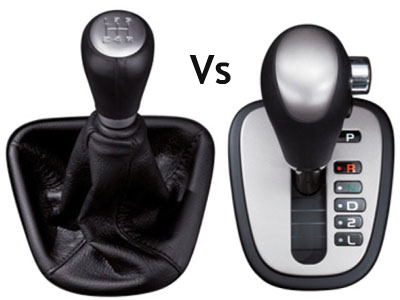 With the great ease in driving the automatic transmission has brought with it, today's generation so large in number feel there's no need to learn the manual transmission and as a result there's an higher demand for the automatic transmission than the manual. This has also brought down the rate of manual car theft - you can't go stealing a manual car just because you can drive an automatic transmission. No, it doesn't work that way, best try the other way around. The manual car loves to keep her occupants engaged to avoid unnecessary distractions like staring at other girls(Cars), making phone calls, snap chatting, tweeting or texting. She gives you no choice except if you are too super of a being to keep texting or tweeting while upshifting or downshifting and also stepping on and off the clutch, break or accelerator. The same cannot be said of its rival, the automatic. Nowadays, we pretty well know that everyone can practically drive an automatic transmission but not just anyone can drive a manual car and yes, its an added advantage for car owners who own a manual car - especially if you have friends who borrow more than they give. Bad friend: Bro what's up. My chick is coming over today - can I borrow your car to just drive her around. Me: Sure thing, I'm your man. Can you drive manual? Me: Eeyah, looks like you will be hiring a taxi. If you are a lover of classic and cool cars - old but gold as I love to call it. It's assumed you already know how to drive a manual transmission, if you don't, well too bad they hardly came with auto trannys. This is one of the unique aspects of a manual vehicle that I find thrilling all the time. It seems hilarious that you could bring a dead car back to life but in every sense its just amazing. So, how do you push start a car? - Start the ignition like you normally do. - Put the gear in neutral. - Get 2 or 3 people to help push the car. - Once your car is in constant motion, press down the clutch and shift to gear 2. - Lift your foot off the clutch and step on the gas/accelerator. Off you go, that wasn't so hard right! With all the above listed advantages of a manual car over an automatic car, someone is probably thinking of getting one but feels it will leave an indelible insignia on his/her bank accounts - well, that not something you have to worry about. Choosing to buy a manual car over an automatic transmission will literarily save you a $1000 less (Do the conversion yourself). You will also like to know that not all manual cars sell less than their automatic models, examples include BMWs - which is often same price as the automatic, GM vehicles such as the 2013 Buick Regal GS and 2013 Cadillac CTS-V. Furthermore, records have shown that not all automatics came along with their rival during the production process, 67 percent of 2013 model-year cars came only as automatics...what a spoiler! It takes dedicated time, patience and effort to learn the joys of stick shift driving. Yes, maybe for the first week you'll feel its effects on your joints but once you get used to it - you will become a pro in no time and never want to stop driving. DISCLAIMER: Motoring Nigeria isn't responsible for your actions after reading this article, any actions carried out after reading this article is solely your responsibility. Read responsibly!!! Please do leave your comments in the section below. Toyota To Steal All Attention at the 2020 Olympics With Their Flying Car. PRESS RELEASE: Nigeria Governors’ Investment Forum foster Transnational Investments between China and Nigeria. Hyperloop One Unveils The Routes For Its Supersonic Transportation System. German Mercedes Driver Quits F1 Days After Claiming His Maiden World Championship Title. Motoring Nigeria 2015. Powered by Blogger.